Wedding Bells embroidered single personalised mens white handkerchief. Wedding Bells embroidered single personalised mens white handkerchief. 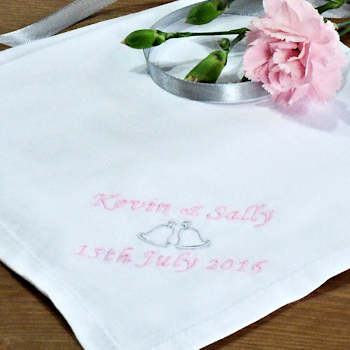 The handkerchief can be embroidered with a title, single name or names and a date of your choice. We custom embroider a mens white cotton handkerchief. Select your handkerchief fabric: A Cotton Hemstitch Hanky that measures 40cm x 40cm with 1/4 inch wide hemstitched edges. (as pictured) Or Our standard cotton handkerchief is 38 x 38cm and has a classic white stripe border.